"The Butterfly Fairy who Approaches God"
History: Eternity Larva is a butterfly fairy who represents metamorphosis. All fairies are immortal manifestations of nature’s aspects, so she is essentially the embodiment of a butterfly’s life cycle. While other fairies pursue different hobbies like pranking, she stands out for being relatively idle. This also means she doesn’t get into much conflict, and each passing day is almost certainly the same routine. Eternity lives in Gensokyo, though nobody’s really sure if she's a native of the fantastic land, or if she "passed into fantasy" like others have. When spring arrives, she spends her free time wandering the Garden of the Sun, which is really just a fancy name for a big field of sunflowers. 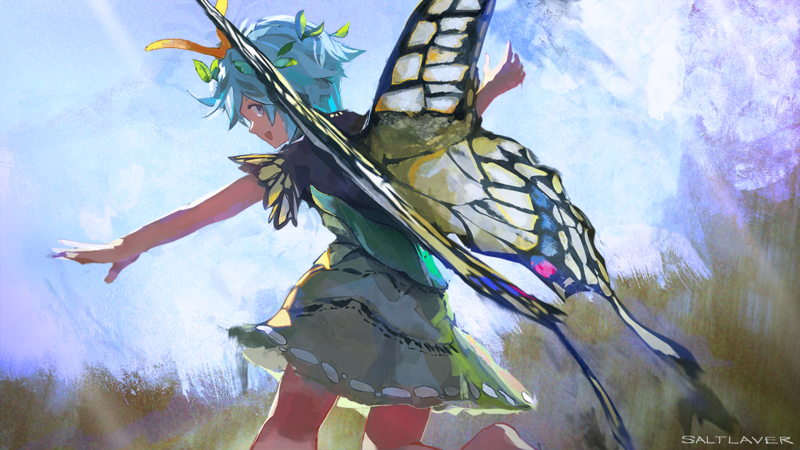 The place is packed with territorial sunflower fairies, so colorful danmaku duels are a common sight. When looking for fun, she may decide to join in the ruckus, though simply hanging out with friends, like the ice fairy Cirno, isn’t out of the question. She’s aware of the more famous resident and has actually seen her from afar. However, anyone who senses her ominous aura and immense strength would know better than to get close. By late fall, she migrates to her underground hideout in the Forest of Magic. This is because she hates the cold, and butterfly fairies like her have nothing to do in winter anyway. Inside there, she can be seen sitting around, or simply sleeping the cold snow away. One midsummer day, an obscure, mysterious goddess named Matara decided to stir things up in Gensokyo. She tasked her servants, Satono and Mai, with bringing out the full potential of the fantastic land’s residents. However, fairies aren't exactly the most “mentally prepared” for being overwhelmed with energy, so they went berserk and started throwing off the balance of nature. When one place was covered in a relentless blizzard, another was brimming with cherry blossom petals. This was the beginning of the Four Seasons incident. Eternity was no exception, being a fairy herself. It was very exciting to suddenly have such unbelievable power, to the point that she often lashed out at anyone she saw. Eventually, her rampage was halted after confronting four powerful individuals who wielded the very seasons. Even the shrine maiden Reimu, who beats down gods for a living, noted that fairies weren’t this strong, and made the connection to the out-of-control seasons. The season-wielders eventually found a strange new place, the Land of Backdoors. After being intercepted by Matara’s servants, the crazy backup dancers, the four people challenged the secret goddess to battle (for their own personal reasons, of course) However, their powers were stolen by Matara, and were kicked out of her dimension not long after. While Cirno, the summer-wielding ice fairy, was talking to Eternity about her long journey of proving herself the strongest in the land, she noticed a door on Eternity’s back which was bringing out her immense power. Out of curiosity, she entered the door only to find herself in the Land of Backdoors yet again. Oddly enough, this gave Cirno the power of doyou, the intermediary “fifth” season. After joining forces with the season-wielders who found their own way to collect this power, they were finally able to take down Matara as absorbing the fifth season was out of the goddess’s domain. The incident then quietly came to a close as the seasons returned to their normal pace. Not much happened after that. She managed to befriend a fairy from hell and, learning from the recent incident, showed her newfound ability to control unstable lifeforce. However, as spring was finally about to arrive, she woke up not in her home, but in a strange void. That was her first confrontation with the being known as Omni. Appearance: Eternity Larva appears as a girl who is quite young. Her height only reaches about 4 feet. She has short turquoise hair crowned with leaves, and light caramel eyes. A prominent feature is her yellow osmeterium: a large, flexible two-pronged “antenna” that protrudes from her hair. She has butterfly wings with a wingspan similar to her height, with mostly yellow scales and a mix of brilliant blue and purple patches near the end. They’re more like accessories, though; breaking them wouldn’t hurt or impair her, and they seem to regenerate holes and tears irrespective of her actual body. Lepidopterists will say she resembles a swallowtail butterfly. Eternity wears a black shirt with short sleeves resembling her wings, and blue scales running down the left side. Big leaves obscure the bottom half of her shirt, an allusion to the leaf-like chrysalis of a butterfly. She wears a green skirt with two shaky black lines and a line of white spots, resembling an Asian swallowtail caterpillar. Other than that, she wears nothing on her arms or feet. *Personality: Eternity is very much like her fairy friends: playful, curious, and energetic. They're more like kids, if anything. Her usual pastime is basically just wandering and exploring the place, sometimes getting distracted by things that intrigue her. Fairies usually aren't bright, but she is an exception. She's capable of making somewhat thoughtful and rational decisions, and is aware of things other fairies don't know like her role of representing nature, influencing life-force, and so on. She also exercises common sense and preservation, so she doesn't get involved into things with uncertain outcomes, as some fairies are wont to do. For this reason, she stands out among them for being particularly "gentle”. Her vocabulary leans toward clean and simple, just enough to hold an average conversation on most topics. She has some trouble with deeper words, but not to the point that it’s immediately obvious. Eternity also appears to be one of the few fairies who can actually read, as she keeps some books in her hideout to pass the time. *Undergoing a revamp after realizing a couple of problems with it. To explain the inconsistency, well... let's just say she's suffering from Omni-summoning sickness, and now she's recovering. Fairies are typically harmless, but Eternity is very powerful for her kind. Her power, endurance, agility and combat ability are rather high, naturally being on par or even exceeding humans with years in training. Despite all of this, she prefers to shoot enemies from afar, since fairies aren’t really built for close combat. Where she comes from, it’s pretty common to see even normal humans walking up to and reprimanding them for their mischievous acts. As a fairy, Eternity is capable of flight. Since dodging curtains of bullets is definitely easier when you can just... fly around it, she’s become fairly adept with its use. Whether it’s getting away from a melee fighter, weaving through waves of strikes, or when she really doesn’t want to walk; if it works for her, she’ll outfly her problems. In fact, one could call it an instinct. Bad news for those without a skill set to match. Furthermore, she can sacrifice her turning speed for higher agility, which is nice when she only needs to catch up to someone straight ahead, or cross really long distances without too many obstacles. Eternity’s power is to disperse/scatter her butterfly scales. Though small and harmless, she can weaponize them by imparting magical energy to carry out her attacks. The energy imbued in these scales can vary, with each type corresponding to their own color, properties, and special effect. As of this moment, Eternity can only use green scales, which act as her basic attack. After a charging period of 2 seconds at half speed or below, 6 scale shards in 3 symmetrical pairs emerge one after another from Eternity’s wings, in the span of one second. The volley first shoots wide at her target, narrowing until the last pair is directly aimed. A glowing, vibrant green energy field covers each shard, measuring 50cm in length by 25cm in width. On contact, the field discharges in the form of kinetic energy, acting similarly to a punch with a force appropriate for her ATK and charging period. Each projectile can travel 30 meters in 3 seconds before petering out, reverting back into benign scales. This move has a high short-term drain and the strain will begin to affect Eternity starting with 3 sustained uses, at which point she’ll have to wait a few seconds for it to subside. However, the long-term drain is fairly light and can be used many times in a single battle before really tiring her out. Eternity begins bombarding the target with swathes of colorful bullets. This elegant show of force is not carried out with the intent to harm, but to preoccupy the opponent with the resulting chaos of beautiful danmaku. This causes the target's TEC to drop by 2, to a minimum of 0 for a single round. This move can be negated by a T1 Super Defense or higher. Thanks to the time she went berserk, Eternity knows a thing or two about manipulating life-force. She wields a very limited ability to control nearby unstable sources of life energy, including but not limited to withering life, forest miasma, and fires of life-force. She can then scatter it around, which others can feel as a warm, “summer-like” aura. Any surrounding plant life would begin to grow rapidly, even regrowing missing leaves. However, Eternity can’t manipulate or affect thicker pools of life-force like people, healthy animals or plants, unless they shape it into something she can use. It also can’t be used in the middle of combat, as it requires her to be fairly calm to use the ability.